Alexandra Park Sports Leaders have been volunteering in their Core PE lessons, to deliver Multi Skills Challenges in our neighbouring Primary Schools. APS SSCo and volunteers have visited the primary schools on a weekly basis to put Years 1 & 2 through their paces. The Spring term saw all of Rhodes Avenue & St.Martin of Porres' Keystage 1 pupils, tested in a variety of challenges. From standing on one leg to target practice with a bean bag. The 6 challenges were taught to the pupils by the Year 10 & 11 Sports leaders and then in subsequent weeks, they are tested on their agility, coordination, speed, balance and accuracy of throwing. 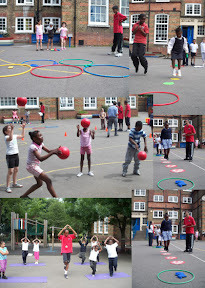 The results are collated and passed on to Haringey's Competition Manager who is responsible for the Virtual Multi Skills League, which all Primary schools are encouraged to enter. The joint initiative between schools, assists the primary schools in delivering the challenges and recording their results. Whilst AP students have a fantastic opportunity to develop their leadership skills. The Summer term sees the initiative spread to Boundgreen Primary School kicking off with Year 1. More and more AP students have volunteered to assist this term, following the positive feedback from peers.